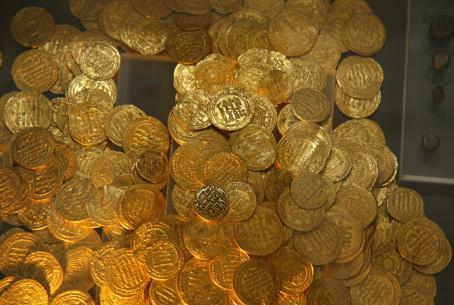 One of the largest gold treasures ever to be discovered in Israel was uncovered last week at an archaeological dig near Herzliya. The treasure, more than 100 gold pieces and weighing approximately 400 grams (nearly one pound), is estimated at a worth of more than $100,000. The coins were found hidden in a partly broken pottery vessel at the Appollonia National Park, where archaeologists say the former Crusader town of Apollonia-Arsuf once thrived. The dig is being carried out under the joint auspices of Tel Aviv University and the Nature and Parks Authority. Included among the items found were 108 gold coins, including 93 that weighed four grams each, and 15 that weighed 1 gram each. The gold was not new and clearly was part of someone's family treasure or business investment. The coins were minted in Egypt approximately 250 years prior to their burial under the floor tiles of the 13th century CE fortress that has been under excavation for more than 30 years. A large cache of arrowheads – hundreds, in fact – and other weaponry, including stones used in catapults, also was found. Archaeologists said the find indicated a fierce battle had taken place at the time the Mameluks seized the area from the Crusaders. According to the website of the Biblical Archaeological Society, the clash has been identified as the Battle of Arsuf, between Saladin and Richard the Lionheart. The Crusader fortress had been uncovered at the site some time ago, along with remains of a port city dating back to the time of the Phoenicians. Archaeologists have also found the remains of a Roman villa, a well-preserved market street from the Early Islamic period and a massive gate complex.